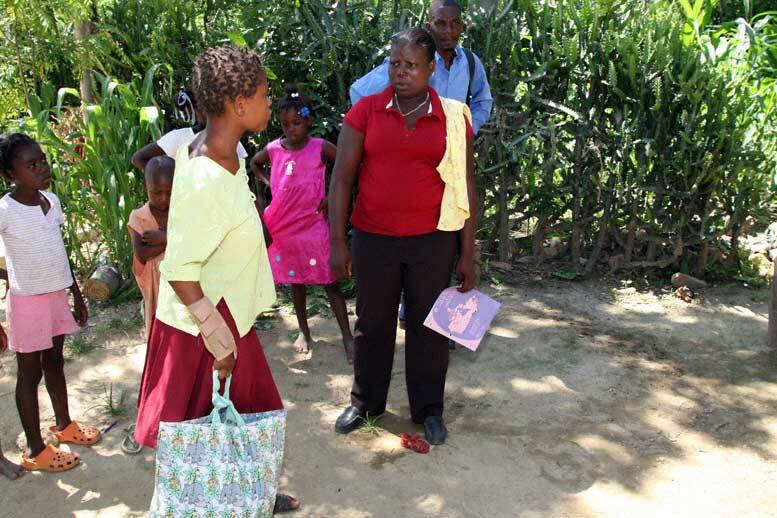 Guerrier Carmen, a member of a Partners in Health Community Rural Mobile Clinic team led by Carmen Maria Romero, a physical therapist from Miami, walked into the baking hot one room home of Kerline Jean Louis in Tierra Thomonde, Haiti carrying a 25 pound pack on her back. This would be unremarkable except that Carmen, a 16 year old Haitian girl with an infectious smile, lost both her legs below the knee in the January 12, 2010 earthquake and now walks on two prostheses. This outing was her first in the field where she would actually perform all the duties of a PIH accompagnateur (or community health worker). Accompagnateurs have been the backbone of PIH’s approach to health care since 1985, when Paul Farmer, Ophelia Dahl, Father Fritz, Yolande Lafontant and a small group of community activists established a one room clinic they named Zanmi Lasante (Partners in Health) in Cange, Haiti, a squatter community of refugees from a dam project where the Lafontants had been working for more than 20 years. From the outset, PIH developed a model of care called accompagnement, accompaniment in English, in which it trains and employs local people, many of them patients themselves, to go out into the community to provide medical care, health education and psychological and social support to their neighbors. An important part of the accompagnateurs’ role is to provide encouragement and a positive role model. PIH believes that it is important that the accompagnateurs be employed rather than volunteers because of the dignity and self esteem that having a job conveys, as well as because the work is valuable and they need and deserve to be paid for it. PIH now operates in 12 countries, including the U.S., and employs over 11,000 people, of whom more than 7,000 are accompagnateurs. Initially, PIH primarily employed accompagnateurs to monitor individuals with HIV and drug-resistant TB, typically making two visits a day to between one and four patients. In addition to seeing to it that the patients take their medications, the accompagnatuers evaluate their entire living situation, bringing that information back to PIH so that PIH can adjust its approach as necessary. As a result of this feedback loop, PIH realized that it needed to take a holistic view of health care, going beyond treating specific diseases to address the social conditions that result in health problems. So, in addition to having expanded its range of care to virtually all fields of medicine, PIH also employs a wide variety of other professionals, including physical therapists, psychologists, social workers and even engineers, agronomists and agricultural training agents. 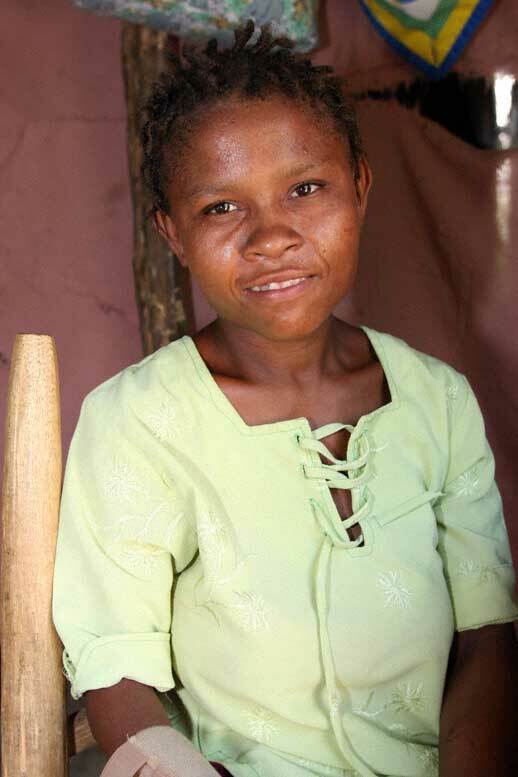 Carmen and the PIH team went to see Kerline, 18 years old, although she looks younger, in the belief that she was in need of a wheelchair, in keeping with the principle that accompagnateurs should share the condition of those they visit, in this case mobility impairment. The primary purpose of the team’s visits that day was to deliver Whirlwind wheelchairs, designed specifically for the rough terrain found in the developing world, to mobility impaired patients. However, despite the fact that Kerline had essentially been sitting passively in a short-legged chair in the middle of her dirt floor for years, Carmen Maria’s examination revealed a happier conclusion. There was no question that Kerline had weakness radiating down her right side, affecting both her arm and leg. Her right arm hung at her side, her hand cupped. Carmen Maria began by slipping an elastic sleeve with a thumb hole over Kerline’s lower arm and massaging and manipulating the arm and hand. After a few minutes of observing and assisting, Carmen took over, continuing the exercises as Carmen Maria rolled a cloth into a tube two to three inches thick that fit in Kerline’s palm. Carmen Maria then had Kerline try to grip the tube, which she succeeded in doing. The next step was to stick a spoon into the end of the tube and ask Kerline to try to eat raisins from a bowl in her lap, which, after a couple of tries, she succeeded at with gusto. With every success, Carmen Maria offered Kerline encouragement, telling her, and her siblings, that she was not a cripple, but had only a “petit problem, tres petit problem”. The next issue was to try to get Kerline up and walking. However, when Carmen Maria helped her out of the chair, she noticed that Kerline’s right foot was turning inward, as if she had a sprained ankle. Carmen Maria had her sit down and wrapped her ankle in an ace bandage. When Kerline stood up again she took a few tentative steps, then seemed to find her sea legs. Carmen Maria led her outside, and with a few adjustments to her posture, Kerline was soon able to walk unassisted, even carrying a shopping bag containing a few items. The source of Kerline’s weakness is undetermined, but Carmen Maria believes that with continued therapy she should be able to get around just fine, and certainly without a wheelchair. Before leaving, Carmen Maria and Carmen taught Kerline’s mother, Adeline Georges, how to put on the sleeve and wrap the ankle, as well as how to assist Kerline with physical therapy. Hopefully, Kerline’s long ordeal of feeling worthless because she can’t even help her mother is almost over. She was smiling, for the first time since the team arrived, when it left. So was Carmen.